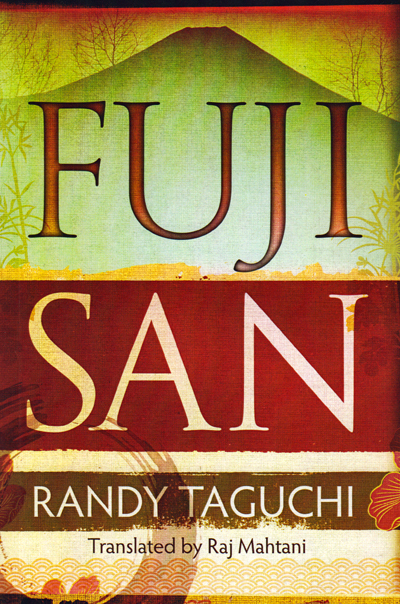 Although Mount Fuji is in the background of each of the four stories collected in this volume, the main theme of these stories is an affirmation of life in the face of fairly extreme social maladjustment and malaise. “The Blue Summit” is about a convenience store worker who begins reflecting on his past experiences as a member of a religious cult after he survives an attempted robbery. “The Sea of Trees” is about three high school students with an interest in the occult who go hiking in the Aokigahara forest and come across a failed suicide. “Jamila” is about a public servant who is tasked with dealing with an old woman who lives in a house overflowing with garbage. “Child of Light” is about a nurse at a small gynecological clinic who ponders a teenage abortion patient she recently cared for as she climbs Mount Fuji with a group of older women. The characters of these stories all face death and the more unpleasant aspects of continuing to live and somehow manage to come out okay on the other side. In this story, the convenience store as a comforting space is juxtaposed against the nightmarish interior spaces of the people who enter it. The narrator is haunted by the memories of a friend he made when he was a member of a religious cult headquartered at the base of Mount Fuji who may have been killed by the group when he tried to defect. Kozue, one of the employees who works under the narrator, suffers from a fascination with dissection and enjoys watching herself bleed. As for the anonymous assailant who unsuccessfully attempts to rob the convenience store at the beginning of the story and later shows up with a baseball bat looking for revenge, the narrator suspects that what he’s ultimately after is a validation of his own existence, a concern that the narrator sympathizes with even as he is attacked. As in “Blue Summit,” physical spaces have a close relationship with psychic spaces, and the narrator’s meditation on an old woman’s gomi yashiki reveals the disorganization of his own (possibly deranged) mind and the sociological state of a nation that produces and throws away so much physical, cultural, and human garbage. If I had to describe these stories in one word, it would be “intense.” There’s a bit of navel gazing going on in Fujisan, but it’s never too cumbersome, and the collection’s four stories move quickly and capitalize on topical issues for emotional impact. If you’re wondering about the publication quality of Amazon’s new translation publisher, AmazonCrossing, it’s actually fairly decent. The front and back covers of the physical version of Fujisan look like printouts of a mid-resolution PDF document, but the inside text is crisp and clear, and the page layout is clean and uncluttered. During the short promotional period when Amazon was offering the book for about as much money as a cup of tea at Starbucks, I also downloaded the digital version of the book from the Kindle store, and it looked great as well. Several reviewers on Amazon have complained about the translation, but I didn’t mind it so much. There were a few sentences that were awkward (they mostly involved slang), but overall I think Raj Mahtani did a great job conveying the voices of Taguchi’s characters. I have read (and produced) a great deal of clunky awkward translatorese, and I know just how terrible it is, but nothing of the sort appears in Mahtani’s translation of Fujisan. The vast majority of the translated prose in the collection is clear and serviceable. It’s never going to win any literary awards, but Taguchi herself isn’t exactly a “literary” writer; she writes popular fiction, and her writing reads like popular fiction. In any case, the translated narrative voices of Fujisan are similar to the translated narrative voice of Taguchi’s previously translated work, Outlet, and readers who appreciated the exploration of hidden spaces and raunchiness of Outlet will definitely enjoy Fujisan. By the way, the author has her own website, which includes an interview translated into English. If you can read Japanese, her blog is also well worth browsing. Great bunch of stories. I found them to have some substance over and above the thrilling story lines with the neat little twists. I don’t mind navel-gazing as long as it is smart and thoughtful, rather than for its own sake and indecipherable. I saw Fuji-san twice on my recent visit to Japan in January 2013. Once all the way from Mt Myoko in Niigata Prefecture – it rose ghost-like above the horizon. Second was on the Keisei Skyliner to Narita International – it lit up like an orange beacon as the sun set.